To create a lasting, positive impact on youth helping them to succeed in school and in life. To provide youth of all beliefs and backgrounds throughout the greater Los Angeles region with strong and enduring, professionally supported one-to-one relationships that change their lives for the better, forever. Catholic Big Brothers Big Sisters was founded in 1925 and is a member of the National Big Brothers Big Sisters Network. As one of the oldest and most respected mentoring organizations in Southern California, it has a peerless record for service quality regularly exceeding national match retention rates, with an “Average Match Length” for mentoring pairs of 34.9 months (as opposed to 28.4 months nationally). CBBBS also has been designated a Blue Ribbon Social Enterprise by the Points of Light Foundation for its superior management of volunteers, and has just garnered an unprecedented fourth National BBBS Quality Award in a row, placing the agency in the top 5% of the 300 organizations that are part of the National BBBS Network. CBBBS has a long history of working with youth facing adversity, and each year we serve approximately 400 young people with one-to-one mentoring matches; assess another 400 children and their families for services (and other social service referrals); and screen and train 500 adults as potential mentors or skilled volunteers. Some of the challenges our “Littles” face can be daunting. They often live below poverty level, in single-parent homes or a foster home. Many also find themselves in underperforming schools. Currently, the high school graduation rate in Los Angeles County is only 60%. However, the close relationship that develops between a child and caring adult in a mentoring setting is the “active ingredient” that builds a child’s self-esteem, nurtures their confidence and improves their academic performance. The help of a Mentor, with the support of our professionally trained and certified staff, is the kind of support that can change the life of a child for the better, forever. 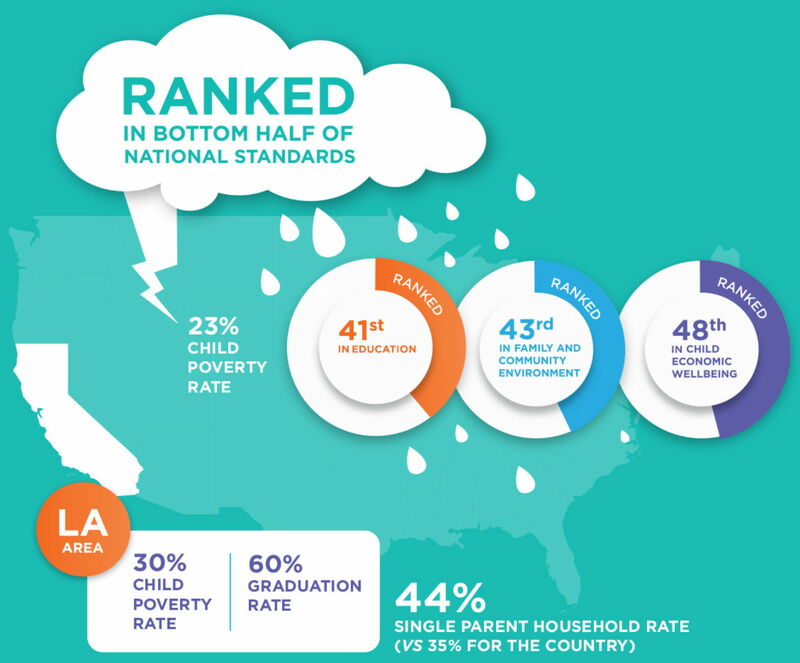 Child Poverty and economic well-being rank at the bottom in california, especially in Los Angeles County. THE CHILDREN CBBBS SERVE WHO HAVE SUPPORTIVE ROLE MODELS IN THEIR LIVES BECOME SUCCESS STORIES. MORE THAN JUST GRADUATION RATES, OUR PROGRAMS HAVE A HUGE IMPACT ON CHILDREN’S LIVES. The skills and confidence our Littles gain from their Bigs make them better students today, and will make them better citizens and leaders of tomorrow. Our Littles are our future. You can help. Make a difference. It’s your money that keeps us going and enables us to start more kids on the right path. So you have every right to know how it is used. Catholic Big Brothers and Sisters of Los Angeles is a 501c3 (tax exempt) organization. Looking for a career with passion, a job you can really be proud of, and a chance to have a measurable impact? Catholic Big Brothers Big Sisters is seeking high-level individuals to join our team. See what positions are available.